A few posts back I discussed hiking footwear. I made the case in that post that choosing the right boot or trail-runner is essential. 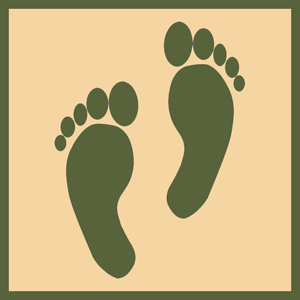 But even more important is taking care of what you wrap that footwear around: your feet! Here are ten best practices to keep you blister—and injury—free for the entire thru-hike of the John Muir Trial. 8. Be careful where you step, particularly going downhill. Ankle sprains occur more often when we walk faster—like when we descend. Once again, trekking poles really help. I’m with Ray in thinking foot care has a high benefit-to-effort ratio. I’d add a few ideas: (1) carefully trim your toenails before you start the trip; (2) consider a small piece of pumice to lightly abrade your heels at the end of each day and at points of callus buildup, at least if you know of places where your skin starts to thicken enough to adversely affect your foot shape or how the foot fits in the shoe or boot (mine does – probably a sign of age); (3) a small container of Zeosorb AF or other foot powder is a nice luxury (shake some into your socks before you start in the morning and maybe midday) and (4 and most important) don’t ignore “hot spots” — as soon as you realize that you have a point of irritation in your feet, deal with it right away, before it starts to blister by removing a small stone, readjusting a sock, changing your lacing, adding a little moleskin or whatever is needed. All terrific points, John. Thanks! Thanks. As a young man I seldom thought about these issues–no longer. I know the feeling, Luis. It’s amazing the number of “issues” I once ignored that now intrude into my daily life! Thanks for the advice and ideas. I have bought three pairs of boots over the last year to find a pair I feel truely comfortable with and doing the exercises certainly helps on longer hikes.